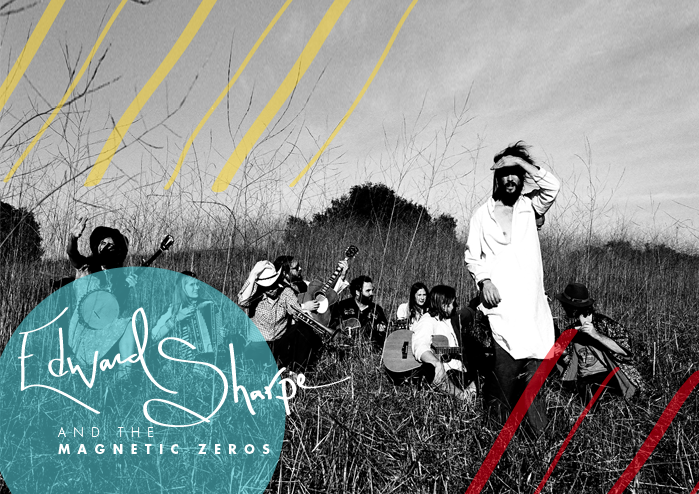 As many of you who have heard of Edward Sharpe and the Magnetic Zeros your first song you heard was probably “Home” maybe on Pandora or the radio. This is where I began. When it came across my Pandora one morning while working I fell in love instantly. The happy go lucky and raw musical sounds were exactly what I needed to get myself pumped to answer emails. Since then I have been completely addicted to their sound. If you have noticed I only write about bands that I can listen to their whole album. So once again this is true for them as well. A direct throw back to the 60’s of peace, free love, happiness, and artist communities this group of musicians travel on tour on an old school bus painted across the sides with their name. From LA originally this band began with Alex Ebert (aka Edward Sharpe). Originally from the power-pop band Ima Robot that released two albums he ended his career with the band after losing his longtime girlfriend. He checked himself into rehab and “rebirthed” his life as he has stated. He began writing a book about Edward Sharpe who came down from above to save the Earth full of love and honesty he brought positive ideas into the human world. This quickly developed into a following of his fellow musicians and a community of unique and genuine art. Known for coming on stage bare foot and a crown on his head, Ebert plays his alter ego on stage but if you notice in “Home” Jade refers to him as Alex. He has began a revolution of music that combines the modern musician with the classic ideas and ideals the 60’s was known for. I have come to base my pandora music list on placing them as the launch pad for the sound I want. You receive everything from Bon Iver and Iron and Wine to Vampire Weekend and Passion Pit. So it ends up being the perfect work day mix if you ever looking for something to keep you creatively inspired throughout the day. Finally I had to post this video of theirs. I always like sharing a video because it always lets you connect and get to know the artist in a more intimate way than even a picture. I am in love with the old filming and their attire. So stylish and beautiful. It feels like jumping back into time to when my parents were young. I think I should have been born in the 70’s I swear.